Have you recently thought about opening your own microbrewery in China? The craft beer revolution—already raging in the United States and Europe—is slowly creeping into the People’s Republic. Gone are the days when Tsingtao and Yanjing were the only options if you wanted to unwind on a cool fall evening in the Hutongs or along the alleyways adjoining the Bund. The market is ripe for selling locally-made, small batch beer in China. So why not enter the fray and start brewing, bottling, and kegging? If this is what you are thinking right now, socialist planners from the heyday of Mao’s China were way ahead of you (and even the intrepid folks at Great Leap, Boxing Cat, and 京A). In 1958, China’s Ministry of Light Industry called for counties and villages across the country to set up their own breweries and get busy serving up draft beer to the people. 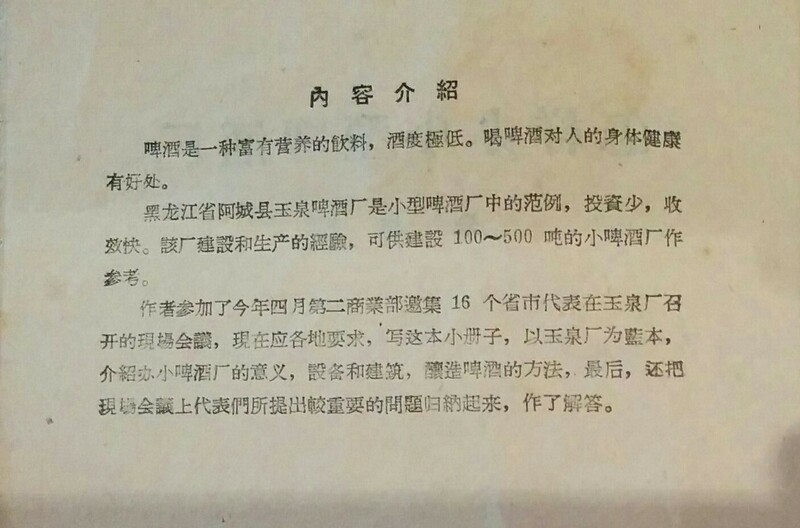 A short, informative tract published by the Ministry, titled How to Run a Small Scale Brewery (September 1958), was supposed to generate buzz for beer and encourage local production. 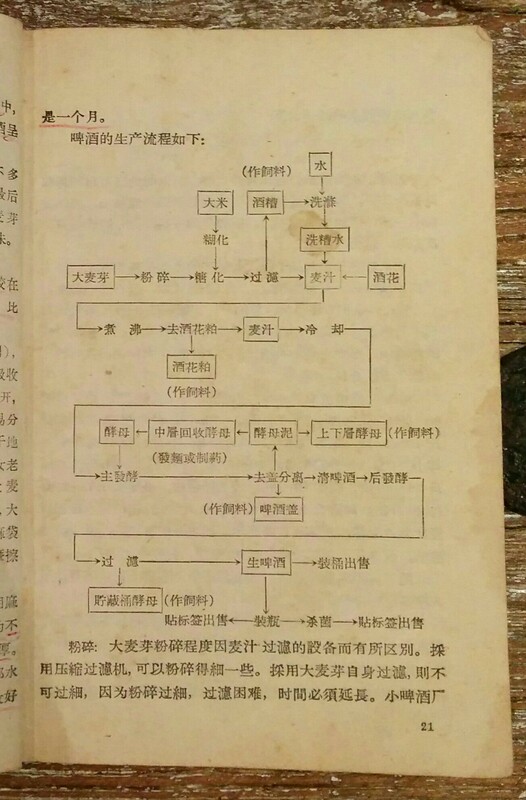 How to Run a Small Scale Brewery was compiled by author and beer advocate Zhu Mei. 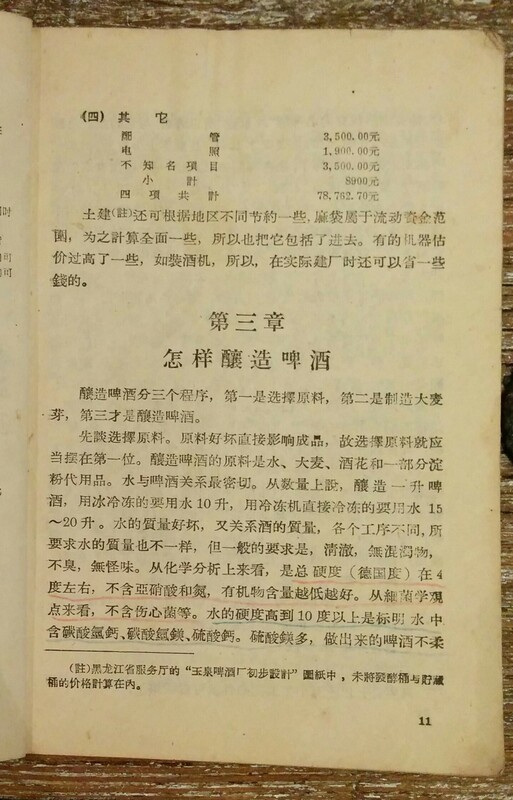 He/she put together the pamphlet following a brewers’ conference and training seminar at the Yuquan Brewery (玉泉酒厂), a model microbrewery located outside of Harbin, in April 1958. Zhu’s writing overflowed with excitement for beer. Not just wanting to teach individuals how to brew beer and how to set up a brewery, Zhu also wished for people to actually enjoy drinking the stuff. He/she boasted over beer’s delicious taste, calling it a “rich and nutritious beverage with low alcohol content.” Compared to strong Chinese spirits like baijiu, beer was inviting and quaffable. Zhu also claimed that “drinking beer is beneficial for one’s health,” and rattled off several ailments which beer could allegedly help to remedy. Beer should have been the beverage of choice for all of China’s people, but with few breweries located outside of Eastern China, it was not always easy to find. Zhu complained that “people in the faraway regions cannot drink beer” because the qualities of beer which made it a pleasure to drink—such as its carbonation and low ABV—made it difficult to transport. Sensitive to light, temperature, vibrations, and, above all, time, beer was not easy to ship within an individual province let alone across the entire country. And even if someone in Yunnan found themselves chugging down a green tinted bottle of Tsingtao, they might spit it right back out upon seeing the bar tab. Shipping costs made what was supposed to be a workingman’s drink a precious luxury to be enjoyed by only a few. “The price is shockingly expensive,” Zhu wrote. Zhu’s solution was simple: China ought to brew more beer and have more breweries. But in an era of huge industrial ventures in China, why go small instead of big? Zhu rejected pouring resources into the building several regional mega-breweries in each corner of the country. Detailing the many benefits of small breweries, Zhu developed a long and persuasive list: they required only small plots of land, just a few workers could run a microbrewery, and inexpensive equipment was perfectly acceptable for brewing small batches. Small breweries could also be up-and-running in short periods of time and start generating returns on investment quickly. Wanting to see breweries in hundreds of counties and cities across China, Zhu offered a primer on brewing, derived from what he/she learned at the Yuquan training seminar. Zhu carefully went through the various steps in making beer, from sanitation to boiling and mashing, onto fermentation, and, finally, bottling and kegging. From beginning to end, Zhu argued that making beer was a simple and manageable process. Despite the many benefits of drinking beer and the ease of making it, brewing tended to elicit confusion and modesty among China’s brewers and potential brewers, according to Zhu. Many individuals believed they did not have the skills or knowhow to successfully brew the liquid gold. But Zhu was convinced otherwise: “in many countries, every household brews and everyone inside the household does it.” In China, too, homebrewing and microbrewing could and should become common place. To emphasize this point, Zhu asked toward the conclusion of How to Run a Small Scale Brewery, “what is so mysterious about beer?” Nothing, Zhu declared. “It’s the same as all other alcohols: turn starches into sugars, and use yeast to turn sugars into alcohol.” If China could make baijiu, it could make beer, and a lot of it. Whether Zhu’s vision was realized during the Mao era is a question to be answered through additional research. Did the Yuquan model take off? Did local breweries dot the countryside? Or did the industry remain dominated by the likes of Tsingtao, Huaguang, and Yanjing? All of the above information, quotes, and photos can be found in 朱梅编,《怎样办小型啤酒厂》(北京: 轻工业出版社, 1958). This is a great find, Charles. Where did you come across the pamphlet? I mentioned it to Chandler Jurinka of Slow Boat Brewing. He’s quite interested in the pamphlet. If you’re still in Beijing, would you be interested in meeting with him? That’d be great! Except I already left Beijing and am back down south. I’ll let you know next time I’m in Beijing though–shouldn’t be too long.